Water, soybean oil, sugar, red wine vinegar, raspberry puree concentrate, distilled white vinegar, salt, maltodextrin, potassium chloride, dehydrated onion, xanthan gum, dehydrated garlic, propylene glycol alginate, sorbic acid and calcium disodium edta (used to protect quality), citric acid, spices, carrot and blueberry concentrates (for color), reb a (stevia leaf extract), natural flavors. The Hellmann's name is recognized throughout the world for unrivaled quality and flavor. 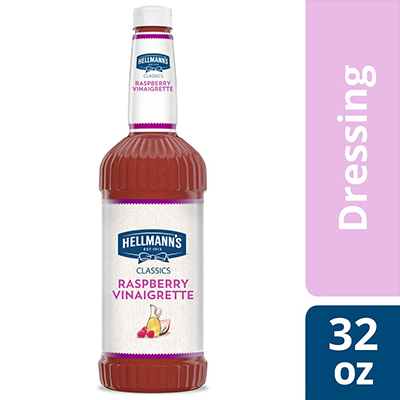 Hellmann's Classics Raspberry Vinaigrette Salad Dressing offers premium quality with shelf-stable convenience. This gluten-free salad dressing is also versatile, with alternative applications ranging from marinades and dips, to glazes and finishing sauces. Serve and store at room temperature.